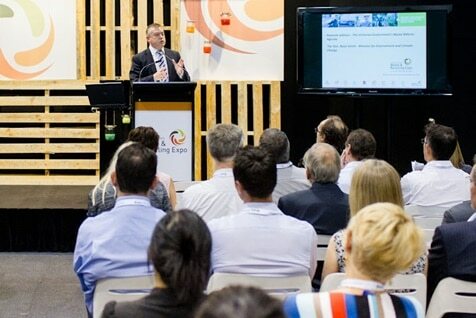 This year, at the Australasian Waste and Recycling Expo, the predominant theme is clearly sustainability. Everywhere, from the seminar sessions to the speakers (which include top notch industry and government luminaries) to the exhibitors and the products, the focus is on presenting innovations and reforms about sustainability be it in handling hazardous waste or taking steps towards reducing landfills. The aim of the Australasian Waste & Recycling Expo (AWRE) is to educate and inform those in the waste industry that sustainable practices are essential and not a luxury, through case studies and by introducing them to new ground breaking technologies. Alsco, the premier Australian managed rental supplies company, provides greener solutions for businesses and workplaces that aim to reduce their carbon footprint. The Alsco cotton Continuous Towel is recyclable. Unlike paper towels, these towels do not get thrown into the waste bin after a single use, only to add to the landfill waste. Instead, they are laundered to ensure complete sterilisation and then delivered back to your washroom for the perfectly dry hands. Avoid landfills with Alsco Continuous Towels. Get your free quote today. The Expo will showcase the efforts of companies like Qantas, which are significantly reducing waste. Qantas is introducing a sustainable packaging program, as well as other initiatives such as recycling on board flights, and also at various Qantas-owned facilities. All these are part of a long-term sustainability initiative by the airlines. Qantas has stated that it aims to reduce waste to landfill by 30% compared to 2009. Two more initiatives on approaching waste with sustainability deserve to be highlighted to show how simple the task on hand actually is. Degraves Street, Melbourne used to produce 700kg of food waste each day, waste that could be easily recycled but was not being done. The problem was that there was no source separation system in place. This resulted in ‘good’ waste making its way to the landfills when it could easily be avoided. Since early 2013, the city of Melbourne and the Degraves Street Businesses have been working together to keep the precinct clean for everyone to enjoy while ensuring that the waste making its way to landfills is reduced. Food establishment staffs from the Street are trained to separate leftover scraps to allocated bins provided by the Council. The waste materials are collected from the businesses and processed on site at the Degraves Street Recycling Facility in Ross House, which hosts a food waste dehydrator, a cardboard baler and co-mingled recycling bins. The dehydrator turns organic waste into pellets that can then be used as compost for gardens. The project has led to an increase in recycling and promoted positive environmental outcomes within the Degraves Street precinct, reducing the environmental and amenity impacts of waste collection and disposal in this busy and popular area of the city. There has been a significant reduction of waste that would have otherwise ended up in landfills. Some establishments have been able to reduce their 1100 litre bins to 600 litre bins while still effectively managing their waste output. This is an all-round win as cost of waste to landfill is reduced. Education has been key to the success of the Degraves Street Recycling Facility. 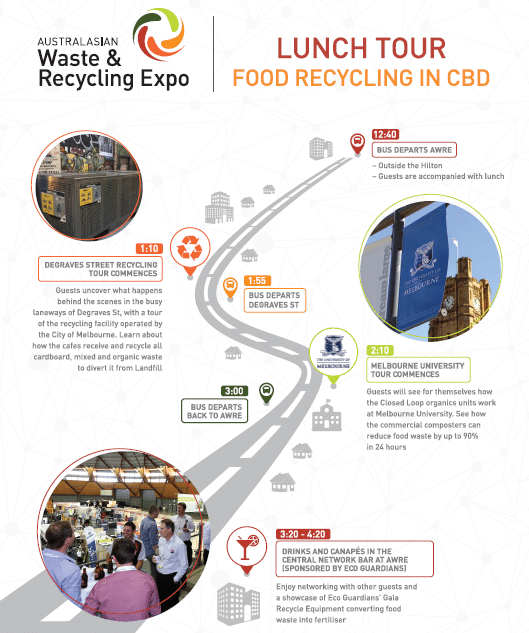 AWRE are running a special guided Lunch Tour: Food Recycling in the CBD on Thursday 13 August from 12.40pm to 3.30pm for those keen to learn more and see the facility. Bevan Dooley, CEO of Integrated Green Energy, shares an initiative that turns waste plastic comprising unrecyclable, mixed polymer plastics into liquid diesel and petrol. Their proprietary conversion system subjects plastic to a high temperature heat stream (above 400 degrees Celsius) in the absence of oxygen. This causes the polymer to break down into smaller molecules forming gas and liquids which resemble crude oil. The liquids are fractionated into hydrocarbons in the form of gasoline, kerosene and diesel fuel. That technology cracks these otherwise ‘uneconomic’ plastic back to liquid fuels. The novel in-house technology, which has been employed for the last three years, cracks and fractionates the plastics into finished liquid fuels straight off the process with a zero carbon footprint. There are, however, obstacles to green energy initiatives such as this. “While I couldn’t be happier with how our end-users and clients have received our business, there are general perceptions of the government which isn’t helping sustainable energy businesses like ours.” Detrimental policy changes over the last few years has seen the biodiesel industry decimated and brakes have been put on by the government in other initiatives too. This has a knock-on effect with the industry hesitant to take on sustainable energy initiatives. To find out more about Integrated Waste Energy visit AWRE 12-13th August at the Melbourne Exhibition Convention Centre, register free at awre.com.au. Simple, hygienic, cost-effective, environmentally friendly solutions for a healthier workplace. Contact a friendly Alsco representative to enquire more.